[align=center]Off the Dyckia campesina group the Esmeralda ( Portuguese word for emerald)is a pretty charming one. This group of Dyckias comes from Northeashern Santa Catarina and has not being studied has it should be. Here many similar plants grow close to one another and they interbreed in nature producing plants that are just breathtaking. The predecessor plants are long ago vanished and are not found but we recognize characterists of those long desapeared plants in these "updated" new plants. Some of these are just two, three individuals or a very few, some are hundreds or thousands and some are only ones. 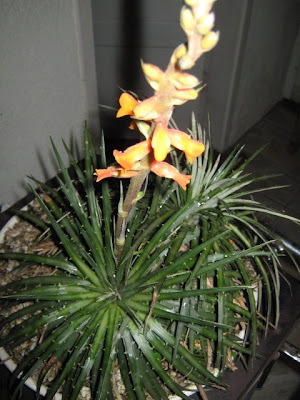 Definetly the Santa Catarina Northeasthern Dyckias are all much too intriguing and they all seem to have one very convergential point: The blooming...they have huge flowers for any Dyckia parameter. Wanna see it? 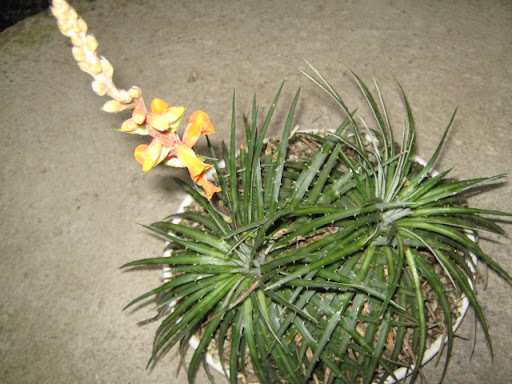 Note the two lower flowers have already been polinated.